Our interview today is with Eva Peck. Thanks for being here today Eva and for agreeing to do this interview. Thank you for the opportunity to do this interview, Russell, and greetings from Australia to all your readers. 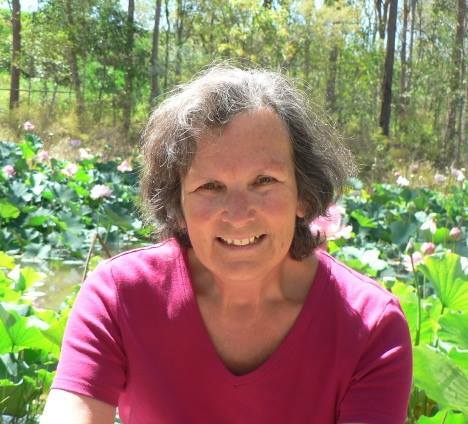 Although living in the land “down under, I see myself in a much broader way, having been born in Europe, finishing my education in Australia, and having worked many years for a church in California, USA, as well as later teaching English in Asia. Similarly, as a Christian, I like to transcend the denominational boundaries that so often divide us. The picture below gives you a very small feel for Australia. Question: What do you think prepared you or qualifies you to write in your chosen genre? Answer: My genre is Christian devotional non-fiction. Besides God’s inspiration, I have combined my knowledge of the Bible with my love of nature. The church which I became a part of at the age of 17 gave me an excellent grounding in the Christian Scriptures. Later having the opportunity to fellowship with Christians of various denominations gave me a broader Christian perspective, for which I am grateful. I also have a Diploma in Biblical Studies and a Masters degree in Theology. Since childhood, I have been fascinated and inspired by the natural world. Later I studied science subjects in high school and university, and graduated with a Bachelor of Science degree. 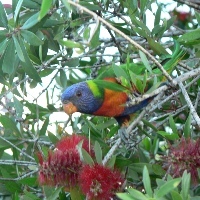 Below is a glimpse of a beautiful Australian flowering bush with a colourful parrot (lorikeet). Question: Tell us a little about your “real” (Non-writing) life — family, job, church life. Does it give you inspiration for your writing? Does it get in the way of your writing, or are there times when you get help, from people or circumstances? Answer: I live with my husband and we are blessed, after having taken an early retirement, to be able to devote ourselves to writing and creativity. We are both writers and editors, so we have either worked together on a book or edited each other’s writing. We have also been able to bounce ideas off of each other, which has been very beneficial and resulted in superior outcomes as far as our books and websites (described at http://www.pathway-publishing.org. Question: Tell us about things you enjoy — what you do for fun or personal satisfaction? Answer: I am very proud of my 90-year-old father — pictured below — who since his retirement in 1979 from being a classical musician (principal oboe player in the Melbourne Symphony Orchestra) has devoted himself to art. My husband and I have found an affordable way to publish his literally hundreds of art works in full-color books. The graphic design and compiling these books for publication has been my form of creative relaxation. Question: Have you done anything writing-related, but besides your books, that seemed to get a lot of positive response? Something that encouraged you? Answer: I have created several websites, including one for my father’s artwork (see http://www.pathway-publishing.org/websites and http://www.henrydegen.com). When my husband and I taught English in Czechoslovakia (now Czech Republic) after the “Velvet Revolution” of 1989, we were able to have published a conversation book for English learners entitled “Let’s Talk”, which sold over 65,000 copies. Its updated sequel, “Let’s Talk Anew”, now in its third year of existence can be seen at http://www.fraus.com/lets-talk-anew-modern-conversation-topics/. Answer: In a way I have different purposes in different books. 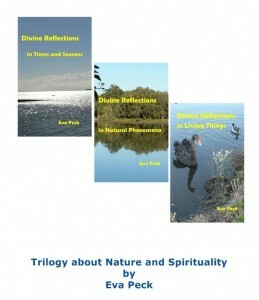 My “Divine Reflections” trilogy (Divine Reflections) aims to make readers more aware of how the natural world surrounding us reflects higher spiritual realities. Divine Insights from Human Life reflects on personal life stories and what spiritual lessons can be harvested from them. 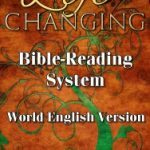 “Pathway to Life Through the Holy Scriptures“, co-authored with my husband, presents the basic Bible message in a systematic, non-denominational way, with the intent of showing readers what the Scriptures really say and how various groups interpret it. Question: Tell us one place you visited or person you met, that made a big impression on you, and why. Answer: Having lived in six countries on four continents (Czech Republic, Sweden, Australia, United States, Korea and Saudi Arabia), besides visiting other countries and places, I had to think hard about this question. 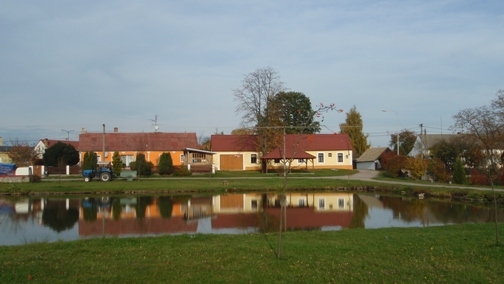 Finally I chose a small village in the south of the Czech Republic (southern Bohemia), where my husband and I spent seven years. What made an impression were the down-to-earth people, who unconditionally accepted us and extended beautiful hospitality. Having come from the West to a post-Communist country and from a city to a small village meant that we needed help on more than one occasion. These dear down-to-earth people were always willing to assist, often without wanting anything in return (even though they knew that by their standards, we were very well off). They taught us that one can be happy and content by living very simply and without owning a great deal. Question: Share something that’s amazing, touching, or that makes you angry. Answer: What is amazing, indeed awe-inspiring and mind-boggling, to me is the whole of creation. By this I mean all that exists around us from the tiniest microorganism to the largest blue whale in the animal realm and the tallest giant sequoia in the plant realm; from our nearest planetary neighbours in the solar system to the far-flung stars and galaxies, as well as spectacular nebulae and supernovas in outer space that manmade telescopes have been able to bring to our attention. The incredible diversity, beauty, order and harmony. And to think that what we have been able to perceive is only an infinitesimal fraction of all there is, that there may well be countless other not just galaxies full of stars and planets, but indeed entire universes which are presently way beyond our ability to comprehend and discover. To me, all this points to a transcendent Mind or Being (God) behind everything who is even far far more incomprehensible than all that exists. Yet humanity in itself is amazing in so many ways, not the least in our ability to reach out, albeit in a limited way, to the transcendent Divine. Question: How many books do you have out? Answer: I have written or co-authored with my husband six Christian devotional non-fiction books. I have also created and published six books featuring my 90-year-old father’s art, photography, and poetry (in Czech). To see all the books with links to Amazon and other online outlets, please visit www.pathway-publishing.org. Answer: There will be more artbooks from my dad’s prolific collection. The next one on the drawing board is “Nature in Art” comprising abstract as well as realistic images from nature. As far as writing projects, I have two in mind. One is a spiritual memoir looking back to key people and events in my life and noting divine leading or intervention. The second one is of a practical kind, namely on financial management — how to live happily and abundantly on a pension amount. It is based on personal experience. Question: Are their characters/stories/scenes/etc based on anything in real life? Answer: Much of my writing is based on real life. The memoir as well as the finance guide mentioned above certainly will be. Eva has also been a nature lover since childhood, studied biological sciences and is drawing on her scientific knowledge and interest in her books. She has an undergraduate degree in science and postgraduate diploma in education, as well as a Masters degree in theology. Readers may like to visit her website, www.pathway-publishing.org for an overview of her and her husband’s works, including the publishing of books featuring her 90-year-old father’s art, photography and poetry (in Czech). Those who understand Czech may enjoy Eva’a father’s verse collection entitled Volne Verse. 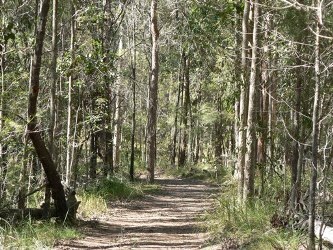 When walking in a park or forest, along the beach or mountain path, do you feel the proximity of the Divine around you? Can you sense the heavens and earth giving you glimpses of spiritual realities? In her trilogy entitled Divine Reflections, Eva Peck explores how everyday phenomena, such as the times of a day, month and year, life progression and habits of plants and animals, as well as other natural phenomena mirror spiritual realities revealed in the Bible. She is encouraging readers to take a deeper look at life’s mysteries surrounding us and to then ponder the insights they receive. Eva Peck writes from a Christian and international background. Through her work in Australia, USA, Europe, Asia, and the Middle East, she has experienced a range of cultures and interacted with believers from a variety of faith traditions. As she feels that different faith perspectives can enrich one’s own spiritual path, she values a nondenominational approach in her spiritual writings. Eva has also been a nature lover since childhood, studied biological sciences and is drawing on her scientific knowledge and interest in her books. She has an undergraduate degree in science and postgraduate diploma in education, as well as a Masters degree in theology. 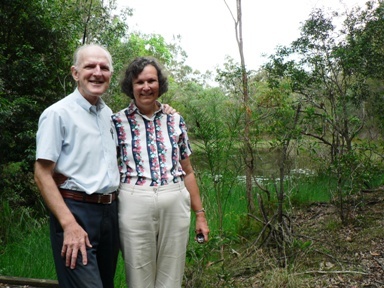 Eva is happily married and lives in Brisbane, Australia. 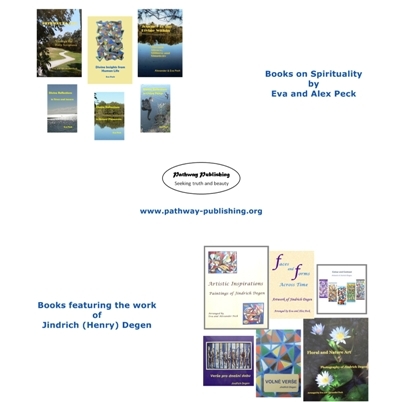 Readers may like to visit her website, www.pathway-publishing.org for an overview of her and her husband’s works, including the publishing of books featuring her 90-year-old father’s art, photography and poetry (in Czech). This site contains Third Party Advertising, using online behavioral tracking technology. Some of the links in the post above are “affiliate links.” This means if you click on the link and purchase the item, we will receive an affiliate commission. Regardless, we only recommend products or services we believe will add value to our readers. Our interview today is with Dave Stone. Thank you Dave for being here today and for agreeing to do this interview. 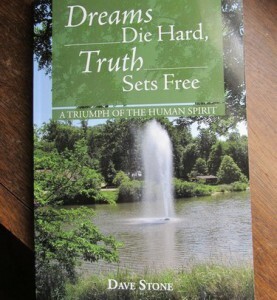 Answer: Dreams Die Hard, Truth Sets Free with a subtitle of: A Triumph Of The Human Spirit by Dave Stone is a memoir/biography of my wife. I am qualified to write it by a BA double major in philosophy and sociology with a minor in psychology and 20 years as her husband. I took her individual memories and old records and wrote of her triumphs over a number of severe disabilities and family problems. 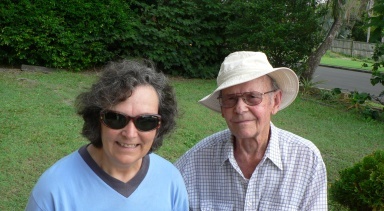 Answer: I am 86 years old, raised by Christian parents, a believer from age 50. My first family of 4 is grown and I have 14 grandchildren. The above book is about my second wife. My major job area was personnel administration. More recently, I have been disabled by impaired balance and hearing from cancer in an inner ear, and limited hearing in the other ear. Christianity is the inspiration in and for my writing. I do get help. Answer: Trying to follow the LORD’S leading is followed by interest in gardening, chess, tilt table I have designed, travel, natural scenery, and serious spiritual conversation. Question: Tell us about working with any people who help you create your books — Do you use Beta readers? Hire an editor or proofreader? How do you get your covers? Answer: My only book so far has had several beta readers, a partial edit of 1700 words and proofreader. The front and back cover pictures were taken by my wife and the words were entirely ours. Question: Since you have several books out, tell us what you think works for promotion. What are your thoughts on ebooks versus print books and different ways to let people know about you and your books? Answer: This is my first book, so I have been looking for ways to promote it. So far, the following seem to be some of them; media book reviews, (print & social), free samples, book readings, discussions on related subjects, finding the books natural audiences (churches, medical establishments, etc. ), quid pro quo promotion with interested parties. Question: Tell us about your newest book. Make us want to read it. Answer: If you want to know how the multiple problems of severe chronic illnesses, frequent movement of military life, alcoholism, suicide, and molestation impact family members this will help. If you enjoy travel logs check here. If you like love stories and happy endings this qualifies. If you want examples of GOD’s power and love this is biography/memoir is for you. Answer: My continuing message is encouragement, and the inspiration of GOD in you of Col: 1:27, Gal: 2:20, Eph: 2:8-10. Answer: The Grand Canyon, for the great beauty of GOD’s workmanship as the clouds troop across the sky changing the colors on its magnificent walls in all their intricate shapes. Question: Tell us one place you want to visit, or person you want to meet, and why. Answer: Israel to see where Jesus walked and understand more clearly what the language of the Bible means. Question: Share something that makes you laugh, with just plain humor, or happiness, or because it’s so stupid. Answer: My statement in the Preface of the book, “darned if I know” to the question of how the book was published after my hunting and pecking on mysterious, stubborn computers. Answer: I am amazed and touched at the LORD’S movement in our lives to reveal HIS love and power to us, especially in my wife’s life. Question: What’s your next project? Tell us so we can’t wait for it to come out! Answer: Just one for now but will be writing two other books. Answer: You Light Up My Life….and a coffee table photography book of my wife’s pics. Question: What is your favorite book/character? Answer: Right now my favorite book is: Divine Conspiracy by Dallas Willard. I just finished your book and, I am awe-struck at the resilience of your wife’s life! Lives will be touched after reading this honest and straight-forward story of a young girl from childhood to adulthood in the face of epilepsy and other illnesses. Though dealt with devastating seizures and other health problems throughout her younger years into adulthood, and her dreams of what she would like to do as she grew up kept dying, she learns to triumph in spirit! In later years as truths of reality and disappointments present themselves, she learns of the wisdom of peace and contentment. Simple truths like knowing the details of illnesses, family dysfunctions, and even facing one’s own thoughts — all open life to face reality head on. This book will touch anyone whose hearts and lives have been dealt with adversity — whether by illness, death, or just by learning of a truth from the past that was so different than what you knew it to be. 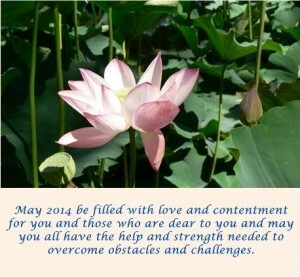 Life is never what you expect it to be, but life can be triumphed over and lived in beauty and contentment. An interesting thought that I got from reading your book which you would enjoy (I think) is for you to write a book on your travels with pictures. Because of all your wife has been through, she sees BEAUTY in ways others do not, and the story telling is wonderful! I can see you both in the telling of your travels. It was so enjoyable seeing the places through your eyes. A wonderful testimony with a triumph ending!!! Definitely would recommend your book to everyone. Your life events will bless someone who needs encouragement and uplifting. God will bless you. This is one of the most inspiring stories that I have read in a very long time. I would recommend this book to family, friends, church family, doctors and etc. Thank you for this book. This book was written by her husband on his wife’s life. It is a book of encouragement and how she overcame her disabilities and is making her dreams come true in her later years in life. It is a book I highly recommend. Here is “reality” in the true sense, some pretty, some not so pretty. God can bring beauty in a life despite the ugliness of dysfunctional families, homelessness, epilepsy, death and other major issues. Our family just received our book tonight and has completed reading it. This book provides great help and insight. I will be giving my book to my children’s school to help out with other children that have similar disabilities. They are very excited about receiving this book. Thank you for taking the time to write the book and help other folks out! A beautiful story about overcoming life’s trials and tribulation motivating and touching! This is one of the best books I have read in a long time. Delivery service was great and book was not damaged. The title of the book, picture of front and back cover were suiting to the title and subjects that were discussed in the book. I just got home from work and received my new book. So thrilled with it and the titles of the chapters pertain to a lot of the disorders that are in my family. Thank you so much for an AWESOME book!! !